Our loaner bowl and one of our own bowls – two distinctly different sounds and vibrations. I believe it is important to try before you buy. I’ve had a few people discuss why and how I use the Tibetan Bowl with respect to “bowling” my husband so I thought that I would elaborate a little about the process. Bowls can be used in sound therapy or vibrational therapy or combination. In our situation we use the combination method. We do not use glass bowls, only metal ones. We have four bowls of various sizes that produce distinctly different tones and vibrations. 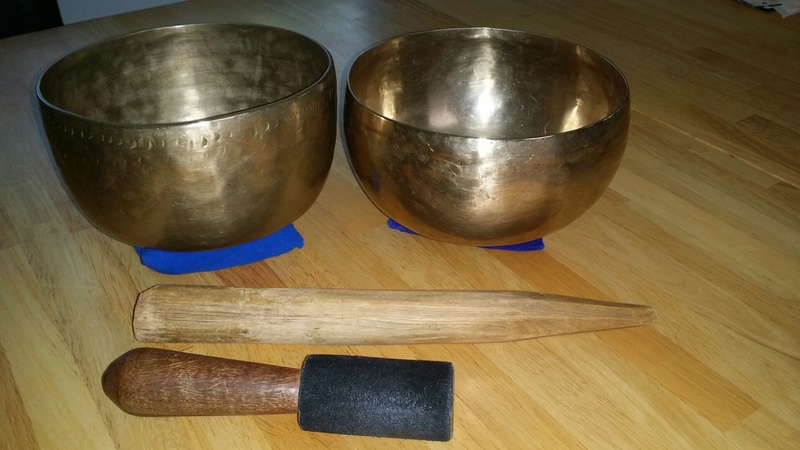 Two of the bowls are hand hammered and considered ‘Master Healing’ bowls; a third is, I suspect, machined; and the fourth is on loan from a friend so I am not certain about how it was crafted – but it plays like a very high quality bowl. I require a specific tone and vibrational quality for the bowls I use. The sound needs to resonate (or “sing”), but the vibrational quality is of the utmost importance especially since I place the bowl directly on my husband’s chest. The premise is that our bodies are composed of somewhere between 55 – 75% water – water conducts vibration. The vibration and sound of the bowl is used to bring the body back into balance and harmony, no dissonance allowed (ref: http://iash.in/general_healing.html). When I shop for a bowl I need to try the bowl to feel how deeply or intensely the bowl vibrates, thus internet shopping for this pricey item is not an option, I have to feel it. Trippy sounding, but I have tried many, many bowls that didn’t meet up to my expectations, they either had a nice sound or a nice vibratory quality, but not often both. To select the tone of the bowl is as unique as every individual. In our case I used my husband’s tone when voicing OM to select a sound – in his case it resulted in a bowl with a deep or low tone. As his breathing capacity diminished after chemo his tone has also changed, slightly, but it has changed. Consequently I have two bowls that I alternate between for his nightly session. Crucial to the use of the bowl is the meditation/visualization exercise that accompanies it. My own practice is to start the session using some deep breathing exercises to help detox the body. “Shallow breathing lets stagnant air and pollutants accumulate in the depths of the lungs and may lead to fatigue, respiratory sluggishness, and diminished tissue function. …Poor breathing allows toxins to accumulate, robs energy and negatively affects mental alertness.” (Source: http://www.globalhealingcenter.com/natural-health/deep-breathing-for-lung-cleansing/) Deep breathing is something that everyone should do, but in my husband’s case it is very important since his lung capacity has diminished after chemotherapy. The deep breathing segues nicely into a very relaxed and receptive state for our “bowling” session. Throughout the meditation/visualization session I use touch to imprint certain states of mind and to create an association between the touch and the particular state or feeling. I have no scientific basis for doing this – it is just what I do and it works well in our situation. We will continue to try different methods of managing pain, fear and stress. The unforgiving reality of our cancer experience is that it continues to have a crippling hold on our emotions. Anything that can give a little peace of mind or release from the anxiety associated with cancer has got to have some benefit attached to it.